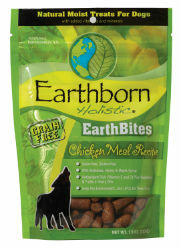 Earthborn Holistic® EarthBites™ Chicken Meal Recipe moist treats serve as a daily reward for your dog. This hearty, antioxidant-rich chicken meal formula is blended with vegetables and fruits in every bite, such as peas, apples, blueberries, carrots, spinach and cranberries. Your dog’s skin, hair coat and immune functions will all benefit from the balanced ratio of Omega-6 and Omega-3 fatty acids.